I'm sitting here in the most bermudaful place as they say here but there are things that I have to do. 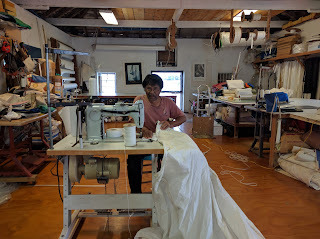 I took my torn Genoa to Doyle's to get repaired, and Atmaji who is from Indonesia helped fix it. He wants to get a job as a sailmaker closer to his home but he says it is impossible to immigrate to Australia. I also had to add a telltale to the top of the mast to show me the wind direction. I climbed the mast and drilled 3 holes to be able to screw the bracket in and while I was up there took a photo of my bermudaful boat from the top. I never get used to climbing up there and especially trying to juggle drill, screwdriver, spanner and windex while passing boats are waking you, makes it not the most pleasant experience although at least it beats doing it at sea when there is nobody else around. The last chore was to put a protective plastic cover over my charge controller. If you remember last week it stopped working and I suspect somehow or other, it suffered from some saltwater intrusion.